Repairing chips and minor cracks in automotive windshields has become a colorful job for field repair technicians at Speedy Auto & Window Glass. That’s because the main frame of their windshield repair fixture is made from a durable, brightly-colored RTP Company 100 Series glass-filled polypropylene. Nearly every part of the repair fixture is made from RTP Company compounds. Speedy’s engineers prefer polypropylene over other engineered thermoplastics as their resin of choice. “It is very durable with good chemical resistivity. And, it’s a dream to mold. It’s so forgiving ? the best of both worlds (mold shrinkage 0.003 in/in, 1/8 inch section (mold shrinkage 0.3%, 3.175 mm section)),” said a company spokesman. 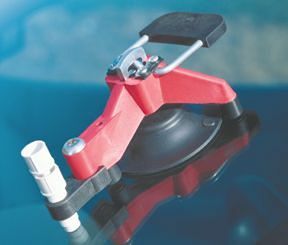 A white glass-filled polypropylene compound is also used for the resin injector held firmly in place by the tool’s suction cup. Once the eye of the injector is positioned over the crack or chip, liquid resin is dispensed by pressure onto the glass. A UV lamp then cures the resin and bonds the glass together for a cosmetically-perfect finish. Speedy Auto & Window Glass operates approximately 100 stores in the Western United States; contact Brad Young at (206) 232-9500.